Coastguards and Merseyside Fire & Rescue Service put their skills to the test this weekend, as they took part in a joint training exercise. Coastguard Rescue Officers from the Hoylake and New Brighton teams were involved in mud rescue scenarios alongside fire officers. 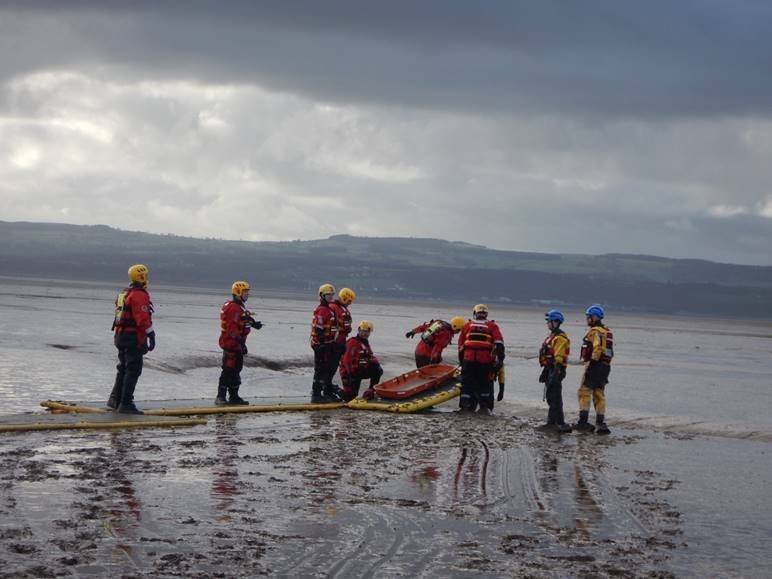 The exercise took place on West Kirby beach on the Wirral on Sunday 30 November 2014. Starting at 8.30am, a simulated 999 call reported that two people were stuck in the mud near to West Kirby Marine Lake, an area not uncommon for real mud rescues to occur. Both emergency services arrived on scene and set up their mud rescue equipment and worked together to free and bring the casualties safely ashore. This was an opportunity for the Coastguard and Merseyside Fire & Rescue Service to share knowledge, training and skills in a collaborative way to benefit future rescues. “In addition to mud and quicksand rescues, Coastguard Rescue Teams are also trained and equipped to deal with a wide range of other emergencies, including water rescue, rope rescue and searching for lost or missing people. The Coastguard is a 24/7 emergency service, ready to respond at any time day or night to incidents on our coastline or out at sea. If you see someone in difficulty at the coast, call 999 and ask for the Coastguard.